A Magazine for Thinkers / A Magazine Devoted to the Higher Mental and Physical Development / The Official Organ of the New Thought Church. 1/1, March 1906. 50 cents a year, 16 pp. The journal was a fairly typical example of the commercialized "success" side of New Thought at the time, with the exception of the lineup of confidence men and mages who appeared in its pages, most of whom moved in the orbit of Elmer S. Knowles (a.k.a. Elmer S. Prather, Professor cairo, Professor Roxroy, Clay Burton Vance, etc., etc., 1872-1940) the owner of the journal and a central figure in rationalizing the business of commercial New Thought. 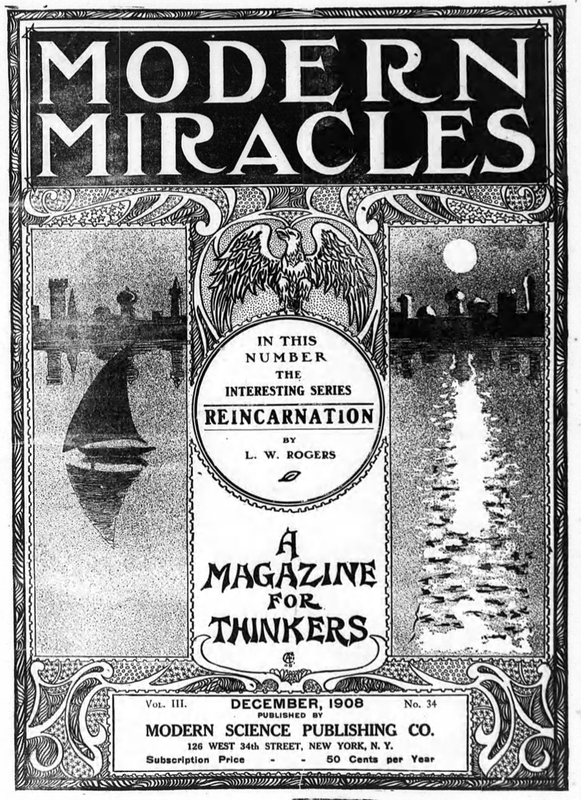 A huge part of the magazine l was devoted to advertisements of the sort that graced many other New Thought magazines of the period, including George C. Pitzer's "Drugless Healing"; "Osteopathy in a Nut Shell"; "mystic Talismans Free"; "The Optical Concentrator and Cabalistic Magic Disc" ("to develop psychic powers, concentration, will power, memory and thought force") sold by one of Knowles's other ventures; George W. Carey's "The Natural Law of Cure"; the Zancigs' "Psychic Cards"; Mrs. Cora B. Miller's cures for "female complaints" ("she will give $50,000 worth of medicine absolutely free to aid suffering women"); Hugh McKean's "Start a Business" (he was Knowles's brother-in-law and brother of the editor); "I Will Heal One Case in Each Neighborhood, no matter what the disease or how serious, free of charge"; "Essenology" ("how to use the powers of your mind in Prevision, Telepathy, Self-Healing, Weather forecasting, and Mineral Divination"); and the Rev. S. Christian Greathead. This last luminary was, among other things, a disciple of Levi Dowling and Reverend Junior Deputy Grand Rabboni of the White Temple, and Chief Shriner of the Circle of Our Lady Gloria in Battle Creek. Surprisingly, it also carried an advertisement "A Miracle" that shows another side of A.P. Barton, the publisher of The Life: "Two women were healed of breast cancer in an advanced stage through mental treatment given by A.P. Barton." The journal prominently mentioned ("Good News for Subscribers, Readers and Stockholders") its own announcement of the payment of a dividend of 7% on its stock and solicited readers to buy shares at $7.50. In other words, pay that amount to get a piece of paper and and 50 cents--a fairly typical Knowles exchange. The journal featured various departments, including George W. Carey's Department of the Chemistry of life, Professor A.H. Postel's Department of Scientific Astrology (complete with photograph of Postel and an offer of "Free Astrological Readings" and another advertisement by his wife Dorothy for her "Rose Beauty Cream"), a Dramatic Department ("The Psychology of Acting") by a Miss Nancy Ellis, a "Boys and Girls" page, book reviews by Carolyn Hart, and "Talks" by Beatrice Knowles, the editor. There were articles by the likes of R.S. Clymer, who says that his book True Spiritualism was first serialized in this journal, and L.W. Rogers, editor of the American Theosophist and future head of the Theosophical Society in America, whose lectures on reincarnation were published in the journal, and contributions by Julia Seton Sears (the journal held itself out as the Official Organ of her New Thought Church in New York). We learn of H. Spencer Lewis's early involvement in the journal as an assistant editor from an interview in the Washington Times in 1906, in which he also describes himself as "an instructor in the Metropolitan Institute of Science," a notorious mail-order purveyor of mysteries and psychic development organized by Knowles and closed by the government in 1907. The New York Sun, August 22, 1906, notes that Lewis was also an associate editor of the journal and instructor in hypnotism and that Albert H. Postel was associate editor and professor of astrology. In early January 1909, Modern Science, the American Temple of Astrology, the Psycho Success Club, Albert H. Postel, and Knowles were served with orders to show cause to show why they should not be barred from the mails, but in the event only Postel and the American School of Astrology ended up being barred, although the charges probably marked the end of the journal. Lewis had in the meantime moved on to another journal, The Future, started by F.T. McIntyre (an original associate of Knowles in the Metropolitan Institute of Science) which had been using Future Magazine as the vehicle for a scheme for selling pre-printed horoscopes for $3.00, as well as a full line of charms for becoming expert in hypnotism. In April 1908, this too was barred from the mails, together with its principals, Professor Lewis, Prof. H. Spencer Lewis, The Lewis Co., H. Spencer & Co., and others. Noted in Progressive Thinker, May 26, 1906, as "an excellent monthly started by the Modern Science Publishing Co., No. 126 West 34th Street in New York." "Devoted to Spiritualism and kindred subjects." A trade paper, announcing the new magazine said that it would be devoted to "hypnotism astrology and other mystic lore. "Noted also in New Theology, September 1908, Thought, December 1907, and Open Road, 1909. By 1911 the newspaper directories show that the company and the editor, Mrs. Knowles, were putting out another journal, The Optimist, that may be a successor. Ayers' Directory describes the journal as "psychological." International Institute of Social History (Amsterdam).